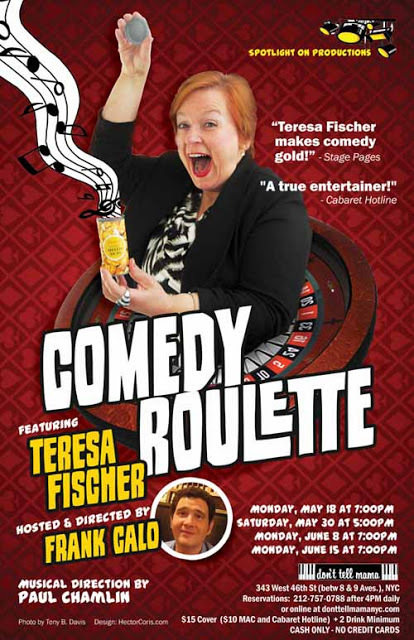 THEATER REVIEW: Teresa Fischer’s "Comedy Roulette"
As an accomplished cabaret star who has repeatedly proven her ability to carry a solo show, we believe that Fischer has the vocal chops to succeed in ANY musical genre she’d choose. On her 2012 debut CD “Let It Go”, she brought her listeners a widely eclectic mix of songs– from power ballads to some truly quirky, decades-spanning musical gems pulled from the vaults. Yet, comedy seems to be Fischer’s calling card. Striking as she is to look at, there’s a distinct absence of vanity in her performances– which is always essential for comedy. She evokes the spirit of funny lady Carol Burnett for songs like “Screw Loose” (from the unsung hero musical “Cry Baby”), in which her deadpan delivery really drives the number over the edge. In “Comedy Roulette”, the audience is also treated to such feel-gooders as the ageless Jack Yellin/Sammy Falin “Are You Havin’ Any Fun?”. For this one, she teams up with the show’s Host/Director Frank Calo, who seems all too happy to play her “second banana”– as evidenced, perhaps, by Calo’s banana yellow-colored tie. The two teamed up again later in the show for the dearly demented “Poisoning Pigeons in the Park” by Tom Lehrer. (It’s EXACTLY what you think it is!) Fischer moves right on to “Das Chicago Town”, which was originally made famous by another woman of comedy, Madeline Kahn. Loaded with double entendres, Fischer gives the song all the campy glory it deserves. Next up is the oft-revived (most famously by Bette Midler…) “In These Shoes”, another comic gem. In honor of the song’s Latin flavor, Fischer and Calo handed out maracas(!) for some audience participation. If her previous selections of songs were humorous, her next one was definantly absurd: “The Frying Pan”, a song about the crazy experience of buying the titular cookware item in Macy’s basement. Yep! If you can’t imagine a song about a frying pan, then just wait untl you hear this one. For the record, Fischer’s playlist also includes tracks named “Painting My Kitchen” (complete with some naughty lyrics!) and “Air Conditioner”, a delightfully deranged ditty. Hmmm… Who knew that domestic issues could be the source of such comedy gold? But hands down, nothing can top the climax of “Comedy Roulette”: In a “sneak preview of the upcoming ‘One Flew Over the Cuckoo’s Nest: The Musical'” (Place tongue in cheek now…), Fischer emerges in old-school nurse uniform, complete with blindingly white hat and shoes, for “Ratched’s Lament”. The combination of Fischer’s costume, the lyrics, and her over-the-top operatic delivery (As one observer noted, the song evoked something from “Sweeney Todd” before heading into “Les Mis” territory…) may be more than some audience members can handle! “Comedy Roulette” packs a lot of muscial talent, creativity, and laughs– as well as a healthy dose of insanity– into its running time. Of course, every artist wants to be thought of as “serious”. So here’s my final praise of Teresa Fischer’s new show: This is SERIOUSly funny! “Comedy Roulette” plays at Don’t Tell Mama (343 West 46th St. btwn 8th and 9th Aves, NYC) for one more performance: Monday, June 15th at 7PM. For reservations, call (212)757-0788 or visit http://www.DontTellMamaNYC.com.